Interest in citizenship has never been greater. Politicians of all stripes stress its importance, as do church leaders, captains of industry and every kind of campaigning group. Yet, despite this popularity, the nature and even the very possibility of citizenship has never been more contested. Is citizenship intrinsically linked to political participation or is it essentially a legal status? Does it require membership of a state, or is it only post-national, trans- and possibly supra-national? Is it a universal value that should be the same for all, or does it need to recognise gender and cultural differences? This volume reproduces key articles on these debates - from classic accounts of the historical development of citizenship, to discussions of its contemporary relevance and possible forms in a globalizing world. 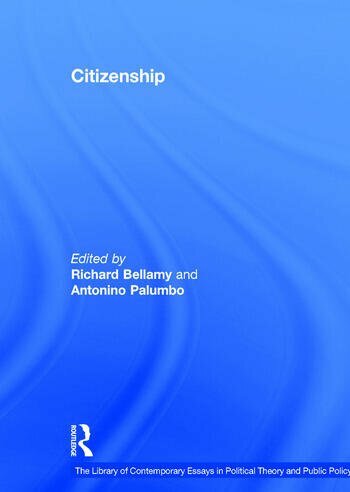 Contents: Introduction: the importance and nature of citizenship, Richard Bellamy; Part I The History and Theories of Citizenship - What is Citizenship? : History: The ideal of citizenship since Classical times, J.G.A. Pocock; Ruling strategies and citizenship, Michael Mann; General Theories: Return of the citizen, Will Kymlicka and Wayne Norman; Outline of a theory of citizenship, Bryan S. Turner. Part II Rights - Which Rights? : Citizenship, social citizenship and the defence of welfare provision, Desmond S. King and Jeremy Waldron; A rights-based critique of Constitutional Rights, Jeremy Waldron. Part III Membership - Who Belongs? : Feminist Theories of Citizenship: Citizenship with a feminist face: the problem with maternal thinking, Mary G. Dietz; Must feminists give up on liberal democracy?, Anne Phillips; Multicultural Citizenship: Polity and group difference: a critique of the ideal of universal citizenship, Iris Marion Young; Civic education and social diversity, Amy Gutmann; Immigration and Admission to Citizenship: Aliens and citizens: the case for open borders, Joseph H. Carens; Immigrants, nations and citizenship, David Miller. Part IV Political Participation - What Duties? : Citizenship: an unnatural practice?, Adrian Oldfield; Citizenship norms and the expansion of political participation, Russell J. Dalton. Part V Beyond National Citizenship - Where are we Citizens? : The Case of the EU: Citizenship and national identity: some reflections on the future of Europe, JÃ¼rgen Habermas; Citizenship and sovereignty in the post-Westphalian European state, Andrew Linklater; Transformations of citizenship: the case of contemporary Europe, Seyla Benhabib; Evaluating union citizenship: belonging, rights and participation within the EU, Richard Bellamy; Environmental Citizenship: Environmental citizenship as reasonable citizenship, Simon Hailwood; Environmental obligations and the limits of transnational citizenship, Andrew Mason; Name Index.